Looks like a great product. Love this color. I really like this color. That's great for the five day outcome. Love these rings. Great post. One of my favorite shades. I'll have to look for this. At the moment I'm wearing wet'n wild megalast club havana. I've never tried Orlay before. Love these!! Still love my Extreme Wear Pink Satin. What a great Monday post! I love this color. Sweet rings too. I really like Sally Hansen's hard as nails - limestone. To this day, Orly is my favortie brand of nail polish! I love the bright pink on you! I love when you post nail pics, it makes me wanna be super girly, go home & watch a chick-flick and paint my nails all purdy! I love that color and your rings are wonderful. I like that it was a thicker consistency. So important to me! PS... I just really do adore your hands. So graceful! Wow that is a really beautiful color. It goes lovely against your ivory skin. :) I think it would look good on me too, now that I keep staring at it. Hehe. REALLLLY CUTE. 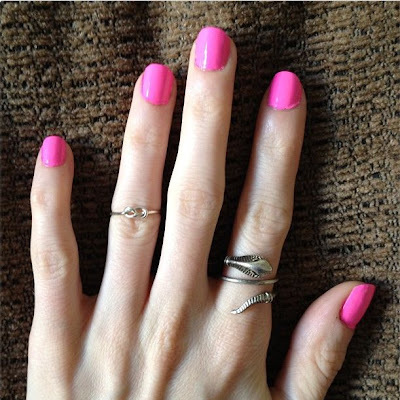 The pink could not be more perfect for Summer! And coupled with a cobra ring? Obsessed! That pink is so gorgeous! I love how feminine and energetic it is. Yes! I saw these photos on instagram and I am obsessed with this color. It is so cute on you too. the pink looks lovely and I really like your ring! 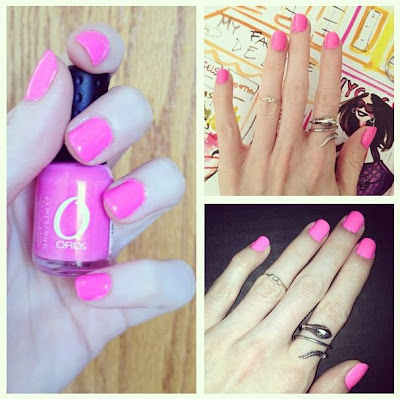 I would probably use 2 coats as well, even though this color is super pink. I think I'd love it as a pedicure. Awesome serpent ring as well. That's such a stunning nail colour. And absolutely love the serpent ring! This is the perfect bold pink for summer! Whooo that's a bright pink. Maybe a bit too neon for me. I tend to prefer the muted pastels. Pink, however, is always a good choice! This is one of my favourite nail polish colours. I need some like this. I desperately need to do my nails today and your post just reminded me. I love that colour! You've got a nice blog! Maybe we can follow each other?